As part of the Travel Penticton, Youth Influencers Program, KVR Middle School students were tasked with writing blogs focusing on four key traveler types: Adventurers, Athletes, Families and Foodies. Below is one of a series that will be released over the next few weeks. We hope that you enjoy these insightful and candid reviews by our local youth and that they encourage you to visit our wonderfully diverse City. If you’re looking for a fun outdoor experience for the whole family, I suggest LocoLanding Adventure Park as it offers a value pack for only $32.00. 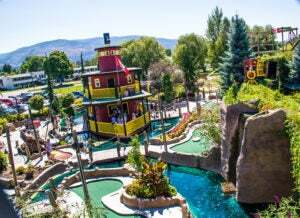 It includes everything in the “FunZone” (AeroBall, BigBaller, Bumber Boats, Go Karts, Monkey Motion, Jump n Slide, Minigolf, Rope Course and Mountain Climbing). The park also serves food. You can also pay $40.00 for 1 hour of using a hoverboard at Okanagan Lake. After all of that you can cool off on the Wibit, a giant bouncy castle out on the water and an all-day pass is only $25.00. I recommend that you go with five or more people and play tag. If you are looking for an idea of an adventure of a different kind, I suggest the Penticton Indoor Virtual Reality (VR) Studio that has tons of amazing virtual experiences. There are even games that people who get motion sickness from playing normal video games can play. Using the HTC vive VR headset you can play approximately 15 different online multiplayer or single player games. 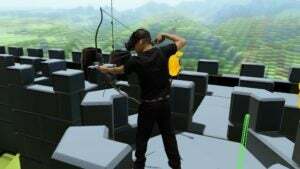 These include (but are not limited to) Quivr, Rec Room, Sparc, Job Simulator, Longbow VR, Zortex, Tiltbrush, Google Earth, Richie’s Plank Experience, Audio Shield, Vesper and Fruit Ninja. Even the elderly can go climbing up mountain Everest without feeling unsteady. If you are looking for an outside adventure in the winter I suggest Apex Mountain Resort, which is known for the best champagne powder in all of Canada. They have tons of rooms and can bundle two adults (including lift tickets for the entire day) for as little as $259.00 a night. The hotels are right next to the hill, so you can literally ski in and out. The food at Apex is absolutely amazing and right under the Gunbarrel Saloon Restaurant is an arcade and a general store and the adults have access to a bar. If you want to get out and see the wilderness, then Hoodoo Adventures is the way to go. They offer bike experiences such as tours of the Kettle Valley Railway and Myra Canyon. They have amazing equipment and bike rentals that can include shuttles to the KVR trail. If you’re going as a family, the bike tours can accommodate younger kids as well. Want to get out on the water? You can try their kayak tours. The beginner tour is two hours long and follows the shoreline of the Okanagan Lake. Equipment and a guide are included in this tour package. 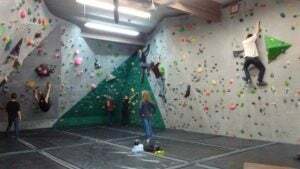 But if all of this doesn’t interest you, Hoodoo also have an indoor climbing gym, and of course they offer beginner classes. During summer hours the climbing gym is open Monday, Wednesday, Friday, Saturday and Sunday from 10am-7pm, and Tuesday and Thursday from 10am-9pm. All of this is great fun, but does cost money. 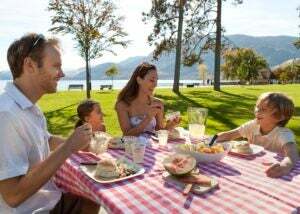 Don’t worry though – there’s still plenty to enjoy if you are on a budget, such as the great parks of Penticton. My personal favorite is Skaha Lake Park. It is located right on the beach and has a water park. For those who enjoy sports this park has three tennis courts, a basketball court, an in-line hockey court and most importantly a sand volleyball court. There are also picnic areas for families, and a playground. If you haven’t packed anything to eat, there are food and drink stands, and you won’t have to worry about finding a parking spot because there’s a big lot on site. 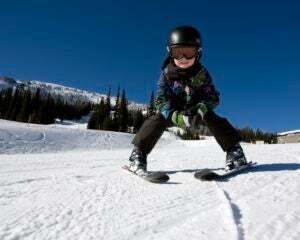 So come on down to Penticton if you are looking for a fun family adventure for everyone during every season. Whether it is virtual reality, biking, skiing or swimming, you can always have a fun time in Penticton!